Plants may store more carbon as CO2 in the atmosphere rises and stimulates plant growth, slowing climate change. Or, soils may release more carbon in response to warming, which speeds up microbial decomposition and CO2 release back to the atmosphere. Changes in rainfall can also affect the balance of carbon uptake and release by the Earth’s land ecosystems. In a recent study, we summarized published results on the sensitivity of the terrestrial carbon cycle to climate change, focusing on plant growth, respiration, and net carbon balance. We found that warming and increased precipitation stimulated the carbon cycle, whereas reduced precipitation suppressed it. Changes in carbon input tended to be compensated by changes in carbon loss, resulting in little change in net carbon fluxes. For more information, see Wu et al. (2010). Do Soils Store More Carbon as CO2 in the Atmosphere Increases? Ecosystems are expected to soak up much of the CO2 emitted from fossil fuel burning and deforestation, but these expectations may be too optimistic. In this study, we showed that soil carbon storage only increases with rising CO2 when enough extra nitrogen is also available – far more than what is normally available in most ecosystems. For this reason, future carbon storage by land ecosystems may be smaller than previously thought, and therefore not a very large part of a solution to global warming. For more information, see van Groenigen et al. (2006, 2014), de Graaff et al. (2006), Hungate et al. (2009). Soils are a biological cosmos, from extremely diverse bacterial and archaeal communities to nematodes, mites, collembola and springtails, key players in the most complex food webs on earth. Yet, we know little about how these biological networks respond to environmental change. In a recent study, we synthesized results from over 75 manipulative experiments to test for effects of elevated CO2, warming, and altered precipitation on the abundance of soil biota. 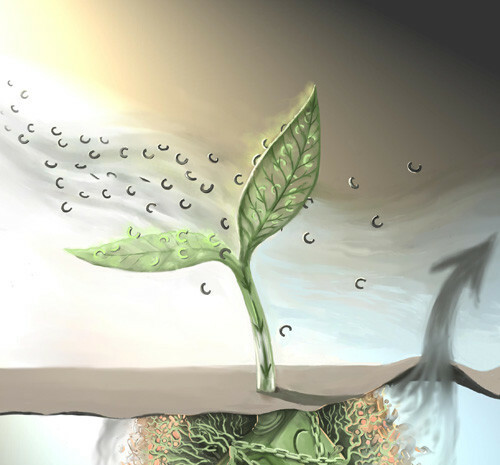 Elevated CO2 initially stimulated the abundances of soil biota, but the effects were short-lived. Warming initially suppressed soil biota abundances, but these recovered over time. Increased precipitation caused sustained increases in soil biota. Our results suggest that responses of soil biota to global change are initially predictable but vary over time, indicating that long-term experiments are essential for understanding responses of these food webs to global environmental change. For more information, see Blankinship et al. (2011). In a recent study, we gathered results from 49 different experiments, mostly from North America, Europe and Asia, and conducted in forests, grasslands, wetlands, and agricultural fields, including rice paddies. The common theme in the experiments was that they all measured how extra carbon dioxide in the atmosphere affects how soils take up or release the gases methane and nitrous oxide. Using meta-analysis, we found that more CO2 boosted soil emissions of nitrous oxide, and that extra CO2 caused soils to release more methane from wetlands and rice paddies. Why? The culprits are specialized microscopic organisms in soil that produce methane, a greenhouse gas 25 times more powerful than carbon dioxide, and nitrous oxide, 300 times more potent than carbon dioxide. With more CO2, photosynthesis by plants speeds up, soaking up carbon dioxide from the atmosphere, and, the hope is, locking away carbon in wood and soil. But our work shows that at least some of that extra carbon also provides fuel to microorganisms whose byproducts, nitrous oxide and methane, end up in the atmosphere and counteract the cooling effects of more plant growth. It’s an ecological surprise, one that climate models will need to reckon with as they further refine pictures of the climate of the future. By overlooking the key role of these two greenhouse gases, previous studies may have overestimated the potential of ecosystems to mitigate the greenhouse effect. For more information, see van Groenigen et al. (2011). Van Groenigen KJ, Six J, Hungate BA, van Kessel C, de Graaff MA, van Breemen N, 2006. Element interactions limit soil carbon storage U.S. Proceedings of the National Academy of Sciences, 103:6571-6574, DOE:10.1073/pnas.0509038103.